In the Beginning of the Cherokee World In the beginning, there were two worlds: The heavenly world called ga-lun-la-ti, which was placed high in the heavens, and the lower, dark world where the forces of evil lived. Ga-lun-la-ti was populated with beings in animal, human and plant forms. 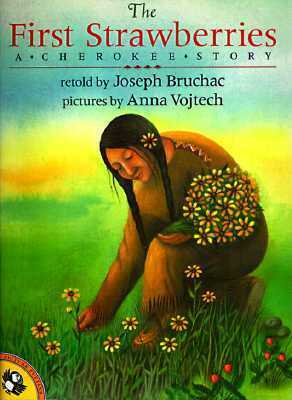 All creatures spoke the Cherokee language and lived together in harmony. The earth was but a ball of water on which gigantic fish and reptiles lived. The universe of the Cherokees depended on harmony and balance. Light was balanced by dark; things of goodness balanced by things that hid from the light of day in the shadows of the darkness. In the beginning there was no sun, but a Great Tree of Life grew in the center of Ga-lun-la-ti. It lit the world so all could see and cast its light down on the dark waters below. So it was that the Creator lived by the Tree of Life where he tended the plants and cared for the animals. Sometimes, the waterfowl, the hawks, and eagles flew down in the darkness below; giant turtles and muskrats swam on the water’s surface and bathed in the pale light of the heavenly tree. The Creator led a solitary existence. When his work was done, he sat by the Tree, admiring his world around him and below. Sometimes he became lonely and longed for a companion, perhaps a daughter who would sit beside him in the evening, watching his creation live and grow. Then, the Creator made a young lady whose beauty and grace touched his soul. He knew that she, too, would long for someone to run and play with so he created a man in his likeness and taught his children the things that he knew. The Creator found that his daughter laughed and sang too much; and she talked constantly. She asked too many questions. Why do the leaves of the Tree of Life shine? Who created the Upper World? Who named the plants? Creator still loved her, for this was his daughter, but this constant laughter and questions, what could he do? The Creator had told them many times to stay away from the Tree of Life and not to play around its trunk. But like all curious children she had to see why her father said these things. First Man would insist that she not go to the tree but every day First Woman would climb the tree to its highest limbs. One day she found a hole in the bottom of the trunk and started to go in. First Man was again insistent that she stay away from the tree but to no avail. She went in and fell out of the bottom of Ga-lun-la-ti. Creator returned home to find First Woman was missing. He asked First Man, “Where is my daughter?” to which the young man replied “I told her not to go into the hole in the bottom of the tree, but she would not listen.” Creator did not know what to do as he peered over the side of Ga-lun-la-ti and saw his daughter falling toward the awesome ball of water. Creator summoned the birds of the sky, to catch his daughter that she might not drown. They created a great blanket with their wings on which they caught her. But, where should they put her? As they flew above the deep waters, the grandfather of all turtles surfaced. “Here, place her on my back,” he said. The birds descended with the young woman, henceforth known as “Sky-Woman,” and placed her on the surface of her new home. But it was not large enough, the Muskrat volunteered to find land and dove to the bottom of the waters and brought up mud, which he placed on the turtle’s back. When she touched the earth that Muskrat had brought, it grew in all directions, becoming the earth that we know today as Turtle Island. The Creator knew that she would need more and so he sent down the plants and animals to take care of his daughter. He sent down the deer, buffalo, bear, rabbits, and squirrels to provide food and clothing. He sent the medicines of the plant people; cedar, sage, bloodroot, oak, and most importantly tobacco. Along with many others things, to provide for his future generation the Kituwah, the Cherokee. When the First Woman, or Sky Woman, was happy with this world Creator sent First Man down to help take care of his creation. First man and First Woman were now husband and wife. They were happy and all things were good, but as in all good things bad will come and First Woman and First Man began to fight and argue. Touched by the man’s anguish, the Great Spirit intervened. Seeing the way First Woman was walking he began to make plants grow at her feet to slow her down. To one side grew the blackberries and to the other grew huckleberries, but still she walked on. Again he made the plants grow and to one side grew the gooseberries and to the other grew the serviceberries, but still she walked on. The Creator knew that this would have to slow her down and so he went to his garden and grabbed a handful of strawberry plants and threw them to the earth. When they landed at First Woman’s feet they began to bloom and ripen, First Woman looked down to see the beautiful leaves and berries of the strawberry plant and stopped to taste just one small berry. As she plucked and ate the berries she forgot her anger. Finding a basket among her belongings, she quickly filled it, and longed for her husband once more. First Man, hurrying on his way, was surprised to see his wife returning, and oh! how his heart did soar. She was smiling! She dipped her hand into her basket, and got a berry and placed it in his mouth. He smiled foolishly, and gave thanks to the Creator. Taking his hand, his wife led him back down the path to their home, feeding him strawberries on the way. O Love of God, How Rich & Pure! A passel of them Golden Biscuits. All yo’ stories . . . .
On dat horn of his’n. Widout no fear an’ tremblin’. An’ pass de time of day awhile. An’ joke awhile wid Jonah. Won’t no servant evah bother wid yo’ room. Den take yo’ time . . .
Honey, take yo’ blessed time. *I read this poem in Inventions of Farewell: A Book of Elegies (2001) edited by Sandra Gilbert. Sandra Gilbert is an accomplished poet and academic writer … When I was a graduate student at UC Davis, she taught a seminar on elegy. I wanted to take it but didn’t. Now I have this book, which is, at the present time, far better than any seminar. This elegy by Sterling Brown is one of my absolute favorites in Gilbert’s collection. I will be teaching an advanced poetry workshop this fall, and in the week we write elegies, we will read this.